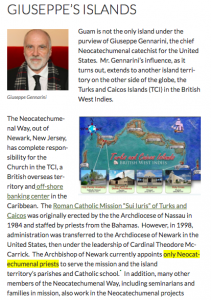 Newark, McCarrick and Turks & Caicos – What's Up With Francis-Church? I’ll do it in point-form. 1. Turks and Caicos, a set of islands next door to Cuba that is a British overseas territory, and a well known offshore tax and banking haven. Tax haven Turks and Caicos is a leading international centre for business and financial services. As a tax haven, Turks and Caicos stands out a regulated offshore jurisdiction which serves as the domicile of many international financial institutions, trusts, mutual and hedge funds, investment companies, insurances and offshore companies. 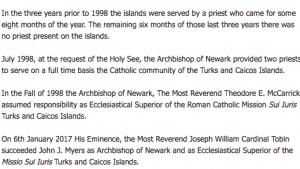 The success of the Turks and Caicos as a tax haven is largely attributed to the country’s stable government, economic growth and trained professionals in the legal and financial fields. 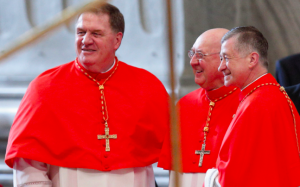 According to Canon Law (cf: canon 368), a Missio Sui Iuris, or mission in its own right, is just the beginning of the establishment of a particular church in a concrete territory. In fact, after planting the word of God into a territory, the mission territory becomes a Church entity called Missio Sui Iuris. 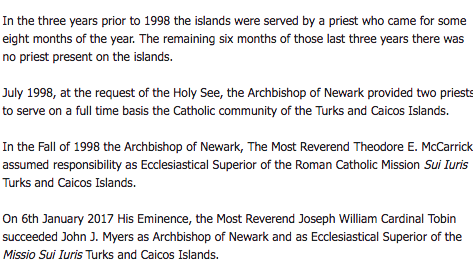 This entity can belong to ecclesiastical territory (in our case, to the Dioceses of Nassau, Bahamas) but be governed by the ordinary of another territory (in our case, by the ordinary of Newark, New Jersey, USA; Archbishop John J. Myers). Thus, the Ordinary who governs the Missio Sui Iuris is its Ecclesiastical Superior. 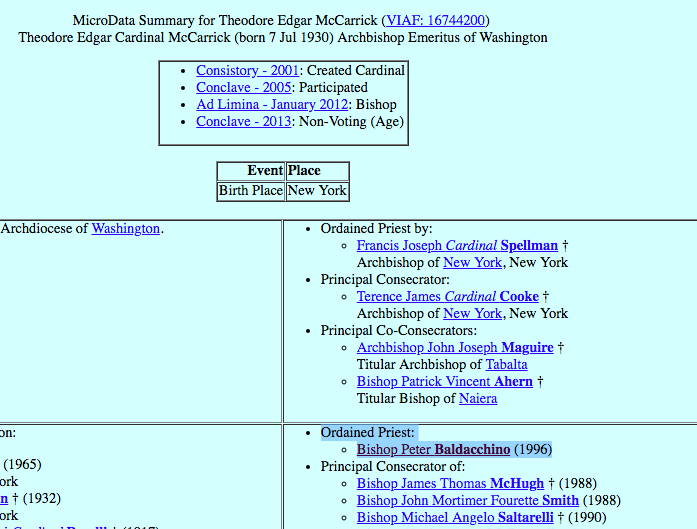 Except of course, it’s not Myers anymore, but McCarrick’s good friend, Cardinal Joseph “Nighty-Night Baby” Tobin. 4. 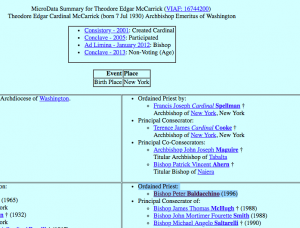 T&C was pretty much ignored by the Church for a long time, until McCarrick was (suddenly! miraculously!) put in charge. Baldacchino, a member of the NeoCatechumenal Way, did titan’s work expanding the Catholic presence there while he was answering to McCarrick who§ was Ab. of Newark & paying the bills. …and for effectively turning it into a Neo-Cat fief. 6. 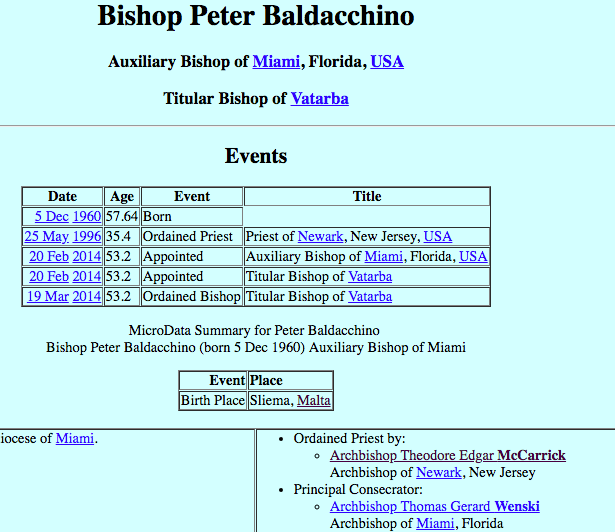 For his exemplary work in building up the Church in Turks and Caicos, His Excellency Peter Baldacchino was elevated to the episcopate and sent to serve the Church in Miami, Florida, as an auxiliary to Ab. 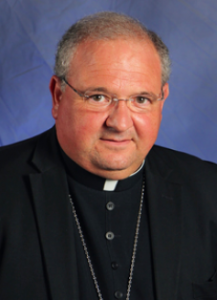 Thomas Wenski. 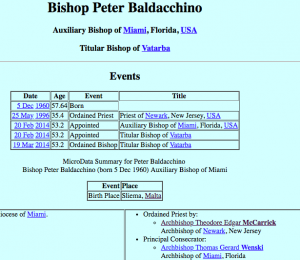 One of the things McCarrick was best known for was his facility at raising extremely large sums of money “for the Church”… Perhaps Bishop Baldacchino could help to clarify some issues related to the Cardinal’s fundraising activities.